Home > Mare's Musings > Triple Crown Season 2014: Didja Ever Love a Horse…? Triple Crown Season 2014: Didja Ever Love a Horse…? As I write this, NBC Sports’ coverage of 2014 Black-Eyed Susan Day has commenced. That which I am about to attempt to express may be unsettling for some. Probably perfectly sensible for others. I am writing a love letter to a horse. But you, O Horse–you are no ordinary animal. First, Dear Rachel Alexandra, I must explain for those voyeurs who also are reading this missive–that all horses are Beyond. Above. Far-more than “mere” anything. Rachel, I believe from my soul that all horses are on this planet because they–you–are messengers from God. Within the aura of a horse is a reflection of the very spirit of the Divine. Only a horse can inspire human souls to seek and to find God. I am convinced that your species is the only breed that can bring an athiest to question his non-faith. Whether a noble Arabian; a sturdy Clydesdale or other Draft Horse; wild horse in the American West–a Cob, Paint, Appaloosa or muscled Thoroughbred–all horses have an intuition to trust God, and the Wisdom to trust His Provision. Horses, like other animals, lack ego–and so, have a better chance of knowing God intimately, more easily. Humans have hubris through which to cut–horses have no such disability of spirit. In other words, it’s easy to trust God for horses and not-so much for humans, because–well, let’s say it–human culture, especially Western human culture–encourages humans to become their own gods. Whether inspired by money, fame or power–humans want to be God. Horses enjoy no such foolish thoughts. Put in comic book form: horses know Who butters their bread, and they’re good with it. That inborn humility opens up the horse spirit to fully enjoy the warmth of Divine Love. It is that Love–and power–about which we mere mortal humans obsess. When we love a horse–whether we realize it or not–we are being touched by the innocence of horses–the innocence that makes their species the perfect messengers of their–of our–Creator. Rachel, my Love, it’s been five years since you won the Preakness Stakes. I just saw the video, and you were magnificent, of course. But I must tell you, Dearest, that the moment I saw your gorgeous face–felt your enormous soul in your eyes–I burst into tears. Eventually I was crying because I miss you. I miss seeing you in the Saratoga backstretch. I miss watching you work out. I miss watching you race, and win. But the first and most immediate reason why I exploded into a hot mess of sweet, warm tears was because your eyes broke free of the Space-Time Continuum. Your eyes, as you walked to the starting gate–revealed that your soul is so deep–so brilliant–so knowing--that I want more. I want to crawl into your soul–is it in your brain? Does it float above your head, or accompany your body, there in Kentucky? This question has plagued both theologians and philosophers for millennia, Rachel. So I have no answers, because we don’t know wherein resides the soul. But wherever it is–I’ve looked into your eyes–I was reminded of this blessing today. And when I saw your eyes today, I was reminded that your soul has so many stories to tell. Your eyes, and your soul beneath, know God so well! You’ve seen Heaven in your dreams. You know the answers to so much. I want that, Rachel. Yes, of course, I love you because you’re a big, hulking, beautiful Champion. But Dear, the first and most important reason why I love you so very much is that–for the rest of my Life–every time I see those eyes of yours–I will feel, know–at least a smidgen of what you feel and know. You allow your eyes to share true Spirit, Rachel. How could I not love you and your willingness to flash reminders of God and the vast magnificence of His Creation, directly into my heart? I will continue to cry, a lot, during horse races after today. I will cry when a longshot wins. I will weep when a horse dies, and connections ache. I will cry when a great story unfolds through the victories of an unexpected champ. I will cry when every horse leaves the gate and I pray for a safe trip for all. But today, my Love, dear Rachel Alexandra, I cried because it had been too long since I’d seen your eyes–and too long since I’d felt that immediacy, that connection. Today you reminded me that all horses are Beyond–and you reminded me that I, too, have an immediate relationship with God–and that I need to nurture that. You don’t have to do anything to feed and grow your knowledge of the Divine, Rachel, but we humans do. You just exist as He made you–and you two communicate so easily. I want that, I must remind myself every day to pray, to read, to walk with God. Thank you for reminding me to seek the One Whom you know so well, Rachel. And thank you, my Treasure, for sharing the depth behind your eyes so generously with me. Every time I see them–every time I see you in video or photo, I will cry and thank God–that you broke down barriers, and did so much for so many, yes, of course. I will thank God simply because you exist. Every time I see you, I will be reminded of what it feels like to fall in Love, all over again. Many horses make me cry, for many reasons. 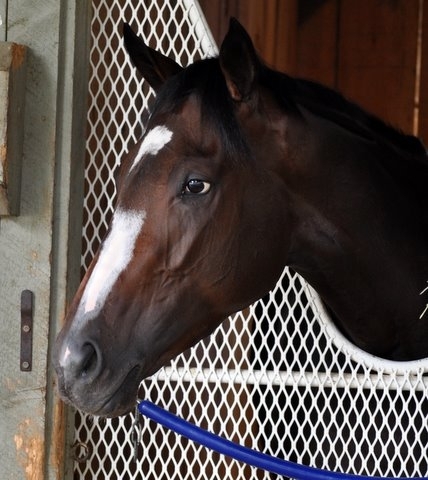 But you, Rachel Alexandra—yes, you broke down barriers, and did so much for so many. But you always will be my True Love on a level that so far transcends the human understanding of that word. Photo, Copyright 2009 by Cathleen Duffy. Previous Article Ria Antonia: Don’t Hate Her Because She’s Beautiful. Next Article Triple Crown Season II: Bobbi Patscheider, RIP. 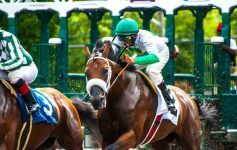 Arabian Racing–and Thoroughbred Racing–Lose a Friend.